I am writing this the morning after a series of violent attacks in Paris that left over 120 people dead, and still it feels callous to even be writing about it. As much of the world reels, there’s something very brutal about the idea that now is a good time to demand that others listen to your very clever opinion. If it’s barbarism to write poetry after Auschwitz, then it’s also barbarism to write think pieces after Paris. Don’t politicize; don’t use mass murder to score rhetorical points against your enemies, don’t crow je te l’avais bien dit, don’t play tug-of-war with the bodies, don’t make this about yourself, don’t make this about politics. Which on the face of it is odd: death is always political, and nothing is more political than a terrorist attack. These events happen for political reasons, and they have political consequences; to have an opinion is nice if frustrating in times of peace, but absolutely essential in times of crisis. And yet. A sense of disgust rises when people comment on France’s unprecedented measure of closing its borders by bleating that if they’d done that earlier, all this could have been avoided; when they start gurgling about the global threat of Islam and the foreigners in our midst; when they smugly declare that restrictive gun laws left the population defenseless. This isn’t a tendency limited to the political right: there are plenty on the soi-disant left also using the massacre as a pristine stage on which to exhibit their one-person morality plays. What if the attackers had been white; wouldn’t we all be talking about mental health? Don’t you know that non-Muslims commit atrocities too? Why do you care about this, and not about all the other tragedies going on elsewhere in the world? Can’t you see that all these bodies only exist to prove that I was right about everything all along? Normally the duty to not opine would only apply to a very small sector of the population, but for the last few years we’ve all been at it. Most of this take-mongering is happening online, and it feels absolutely and entirely wrong to be worthily prognosticating about hundreds of personal apocalypses on the same platforms and in the same forms that are used to sound off about TV shows and and football matches. A lot of this has to do with the demands of the format itself: you’re endlessly encouraged to Have Your Say and Join The Conversation, to constantly be filling white boxes with words, because what you think about any given topic is now incredibly important, and before you know it, in the stampede to have your say and join the conversation, you’re trampling over the dead. We scrawl our thoughts in blood. To express anything other than sorrow is monstrous. But then look at what’s being said. 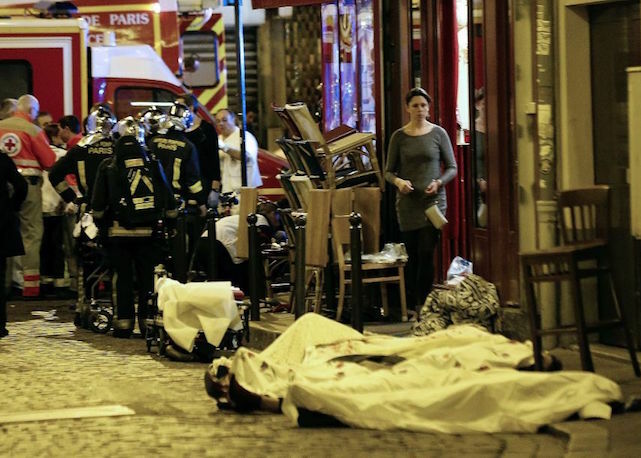 Last night, French President François Hollande stood outside the Bataclan concert hall, where many dozens had died, to say that “we are going to fight, and this fight will be merciless.” There will be more war, more death, and more tragedy. The TV stations are bringing in experts to insist that this is all the fault of the migrants and the foreigners, as if refugees were carrying the violence they fled along with them. More repression, more cruelty, more pogroms. Terrorist attacks, as we all know, are carried out with the intent of setting the people against each other and sparking an intensification of the violence of the state, and so the people are duly set against each other, and the state announces its determination to do violence. This is already a politicization of the tragedy, and to loudly speak out against it is yet another: is that also unacceptable? The humanity of the victims disappeared, they were brutally synecdochized into a political party that some of them may or may not have supported — they weren’t people, they were Hezbollah, as if what had been attacked were a castle sharp with battlements rather than a neighborhood full of families. Many people very loudly voiced their horror at this. But that was also the politicization of tragedy: was that also unacceptable? When it’s deployed honestly, the command to not politicize means to not make someone’s death about something else: it’s not about the issue you’ve always cared about; it’s not about you. To do this is one type of politics. But there’s another. Insisting on the humanity of the victims is also a political act, and as tragedy is spun into civilizational conflict or an excuse to victimize those who are already victims, it’s a very necessary one. There is the politicization that seizes on death for limited political aims, and then there is the politicization that would refuse any predetermined script other than the call for liberation. It insists on the political nature of tragedy, not to shunt it towards one or another narrative pit, or to put a left-ish or right-ish filter over the images of bloodshed, but because politics is a way out of all this. Atrocity demands solidarity. Absolute sympathy for the victims; for all victims. To insist on having an opinion, not the knowing sneer of someone who was right all along, but undiminished solidarity in the face of devastation. To fight against those who attack concerts and cafes, those who bomb cities with fighter jets and with their own bodies, those who abandon migrants to the cold outside their borders and those who sent them fleeing. To struggle: the common struggle of all who suffer, against suffering. Sam Kriss is a writer living in the United Kingdom. He blogs at Idiot Joy Showland .